A SoftBox is simply a larger light with a larger reflector. They are complimentary to, rather than a replacement for, a light tent. 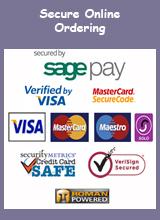 They are usually made of fabric and are collapsible for easy storage. They can be used with a variety of different bulb options but compact fluorescent, continuous lighting bulbs offer the best results for product photography and studio work (see more below). SoftBoxes work really well for lighting larger light tents, especially those larger than 30" (76cm). When used with a light tent, they enable more specialised camera settings, such as a smaller aperture or a faster shutter speed. But beware of over lighting smaller products as this can lead to lack of clarity, blurring the product into the background and images that are too pale or that looked washed out. Unless you have a special reason for needing extra light, light tents of 30" (76cm) or smaller are best lit with our standard lighting set. Remember, it is not always the case that more light is better! SoftBoxes work well as full studio lights for larger products, clothing, portraits and video or for other products that are too large for a light tent. 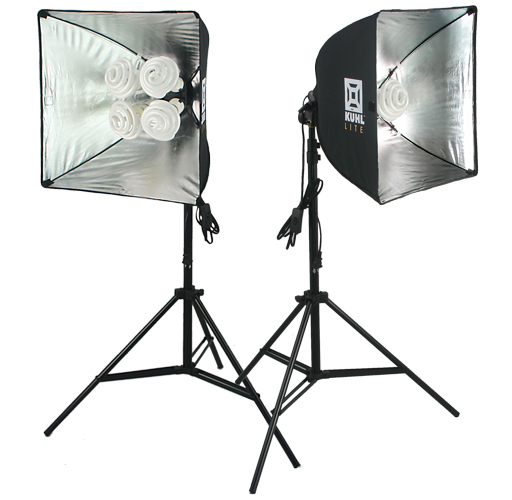 When used with our TrumpetTop bulbs, the SoftBoxes do not heat up, keeping your studio, products and you cool! Why use 4 x 30W Bulbs instead of a Single 105W or 125W Bulb? The TrumpetTop Bulb has been specially designed in a conical shape, wider at the base than at the peak, which allows it to spread the light over a larger area. If you then use four of these, they spread light over a much wider area, providing a larger lit area and much more even lighting of the product. This gives a much more even and balanced lighting, with considerably better results. Four 30W Bulbs give a total equivalent light value of 600W. 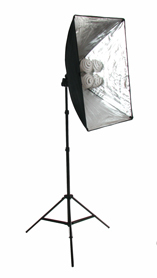 Some SoftBoxes are offered with a single flat-sided spiral bulb of a higher power, such as 85W, 105W or 125W. Flat-sided spiral bulbs tend to direct the light only in one direction, giving more light in the centre where the bulb is pointing, and less light at the sides, surrounded by darker areas. Some SoftBoxes are offered with a triple flat-sided spiral bulb option, such as 26W each (total equivalent light value of 390W). These are better than the single bulb option but they still do not provide anything like the same amount of spread of light that is provided by four 30W TrumpetTop bulbs. The four 30W TrumpetTop bulbs option is a little more expensive, but the increased light utilisation and the improvement in image quality means it well worth it. Why Use a Big Reflector? The larger the reflector, the larger area of internal reflective surface, so the more light "bounce", which gives overall more light effect. Plus, the larger the reflector, the greater spread of light. For the maximum benefit, the light has to reach the reflective surfaces in sufficient quantities to be bounced back. So, if you consider this in conjunction to the points made above about using four 30W TrumpetTop Bulbs, you can see that, if you put a single. flat-sided spiral bulb into a large reflector, most of the benefits of the larger reflector are lost because very little of the light reaches the reflective surfaces. Continuous lighting allows you to set up the shot and to see what the image will be like before you take the picture. This means that you can adjust the height and position of the lights and the positioning and angle of the product to get the exact image that you want. This is especially important if you are using special effects lights such as a Sparkler Light or Diamond Dazzler. The ability to set up the shot beforehand and to see how the item is lit saves a considerable amount of time. When you use flash lighting, you don't know how the item will be lit until the flash goes off, so unless you are a very experienced photographer, you will have to spend time getting the right result through trial and error. Built-in camera flashes have additional problems, such as inflexibility of light direction and the inability to diffuse the light, creating hotspots, shadows and uneven lighting. The best light source for continuous lighting is a long lasting, cool-running bulb as this will allow you to have the lights switched on throughout the photography session at low cost and without overheating the studio, the photographer or the products. For these reasons, compact fluorescent bulbs are ideal. Why Use 5000K Colour Temperature Lighting? Our lighting is 5000K because this most accurately reflects true natural daylight of the kind that will be coming in your window. It is important always use lighting products that all match in their Kelvin value. You should never mix light colours, not even different shades of "white" or "daylight". This applies to window light just as much as to any artificial light you might use. Unless you want to work in the dark (at night or with blackout blinds) then the artificial lighting you use should be the same colour as your natural window light. Natural window light can actually be used to advantage providing that your artificial lighting is the same colour. 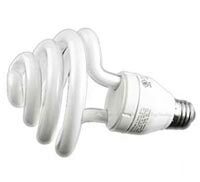 Why Use Compact Fluorescent Bulbs? The Kuhl Lite™ 120 has a 20" x 20" high performance softbox reflector and four of our own TrumpetTop™ Bulbs, giving equivalent of 600W of 5000K perfect daylight. Kuhl Lites are also included in the following Photography Kits: Universal Kuhl Lite Kits, Clothing Photography Kits and Furniture Photography Kit. SimplyFoto Lites are available in three sizes - 40 (40cm x 40cm), 50 (50cm x 50cm) and 5070 (50cm x 70cm) in singles or pairs or as a combined set (one SimplyFoto Lite 40 & one SimplyFoto Lite 50). SimplyFoto Lites work great when combined with an EZcube or a SimplyFotoSqaure Light Tent or a SimplyFoto Light Tent Cube. 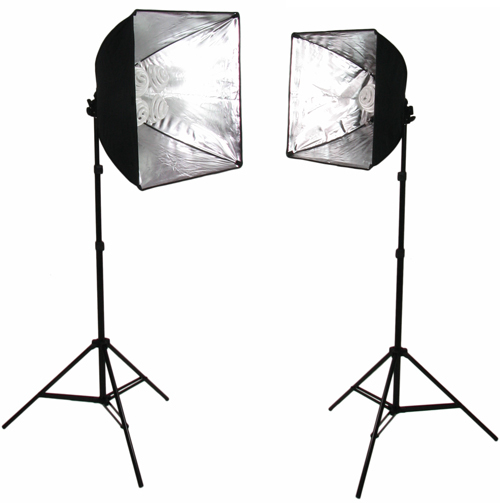 They can also be used as full Studio Lights for portraiture, live models and video.